So. I’m 25. A quarter of a century old. My birthday was yesterday. In the month leading up to this “monumental moment” (not big on birthdays or holidays in general), I have: thrown up twice, almost passed out, been to see my general practitioner four times, been hit on by the local pharmacist, had an ECG done, had one blood test, been to the Emergency Room (not really an emergency – only place open on weekends), spent 2.300Ft/$10.50 phoning a friend to help me find the only open pharmacy after the E.R., spent 1.800Ft/$8.20 on pain medications and muscle relaxers, seen a private specialist (16.000Ft/$73), spent an hour and twenty minutes commuting to private specialist, walked around lost for twenty minutes looking for said private specialist, sent 30 emails to my general practitioner, called doctors’ offices nine times, miss two lessons, spent 30 minutes talking to my nurse sister, and canceled seven private lessons. What is wrong with me, you [caring reader] ask? Who knows? Not me. Not the doctors. I am due for at least three more appointments (one of which will be a neurologist) and another blood test. There is some good news though: My heart, kidneys, and liver are super healthy! 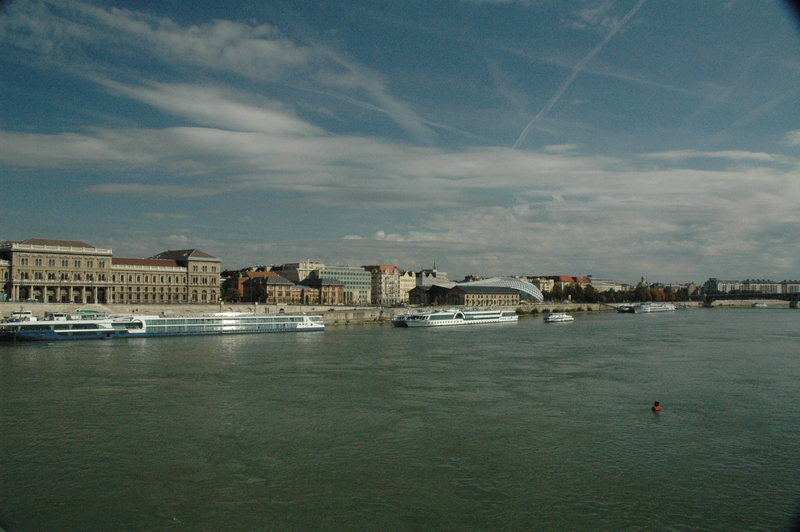 Coming to Hungary was, to be honest, easy. I work at a great school, I love my students, I have some cool friends, etc. This past month of confusion, “sickness,” and no answers has, however, taken a small toll on me. 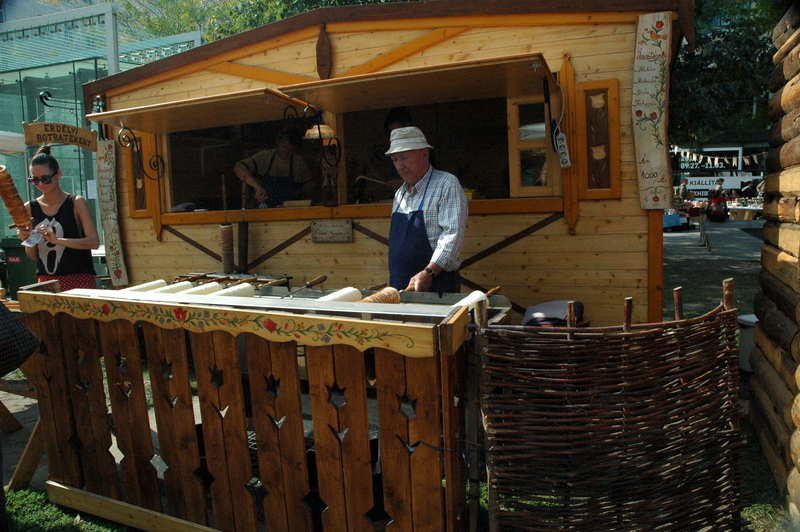 I love Hungarian – speaking it, hearing it, being around it. I have never had a problem getting around until now. How can I communicate what is wrong if I cannot speak Hungarian/my doctor cannot speak English? My general practitioner, Dr. Szabó, is amazing – he has been patient through my panic, called other doctors to push for appointments, etc. I wish the specialist I saw was like Dr. Szabó. I have never been upset that someone does not speak English… until I saw this specialist. Do not get me wrong: If you do not speak English, that is okay! I love you! I love your language! I want to know your language! I want to know you (maybe)! BUT do not ADVERTISE that you are fluent in English if you are, in fact, NOT [click here]. Elementary would be a kind assumption. She also did not do anything. I would have taken even a Hungarian explanation. After a few minutes of talking and a brief check-up, she handed me a piece of paper and expected me to do the rest. Cool. Thanks. No, really. One awesome review coming right up. A lot of the problems with my current doctor situation stems from the fact that I am trying to be as wildly independent as possible. I honestly think that I am the only person in my program who has not requested the help of my program director in this type of extreme situation. Actually that is a lie: When I called her to nonchalantly ask if there was a doctor open on weekends, I begrudgingly ended up at the E.R. Due to her own sickness and my streak of independence, I opted to go alone even though she suggested me to call the second person in charge. If she found out about this… I figure that if I do not have results by the end of the month I will cave and ask for help. I would yell (and have yelled) at people if they were in my place. Why am I the way that I am? I think the part that makes me the most upset is that I might have to forgo my Fall Break 2013 – Poland plans due to time and money constraints. I do not like asking off of work and that damn private doctor put a dent in my wallet. Now that I am seeing public doctors I do not have to pay to go unless something is seriously wrong with me (hoping for the best). The only downsides are that I 1) can’t schedule an appointment, I just show up (unless it’s for my awesome general practitioner – he hooks me up) or 2) have to wait a large amount of time before I can go (for example: one appointment is in late November). 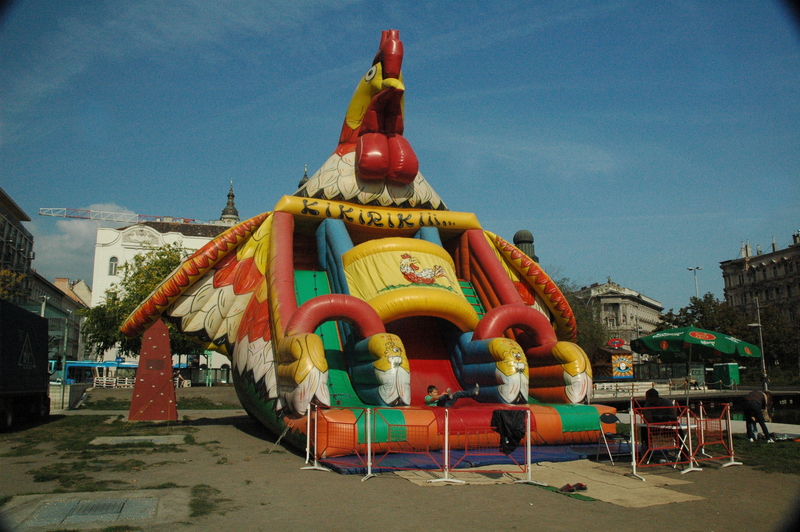 Amidst all the chaos I have realize how privileged I am – I am crying about losing my Poland vacation. I am half amazed and half disgusted. Am I spoiled or is this what happens when you live in Europe? You win some, you lose some. Speaking of: my small camera that I use to make movies BROKE. This life. Whatever. Moving on from this lame aspect of my life… I don’t want to talk about it any longer. 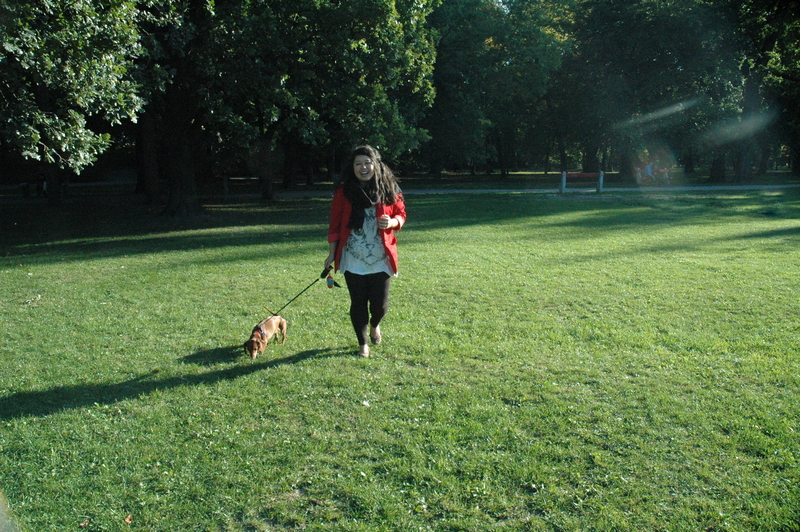 While my friend, Cindy, has been off gallivanting around Europe I have spent two weekends living in the heart of Budapest and playing with her dog! 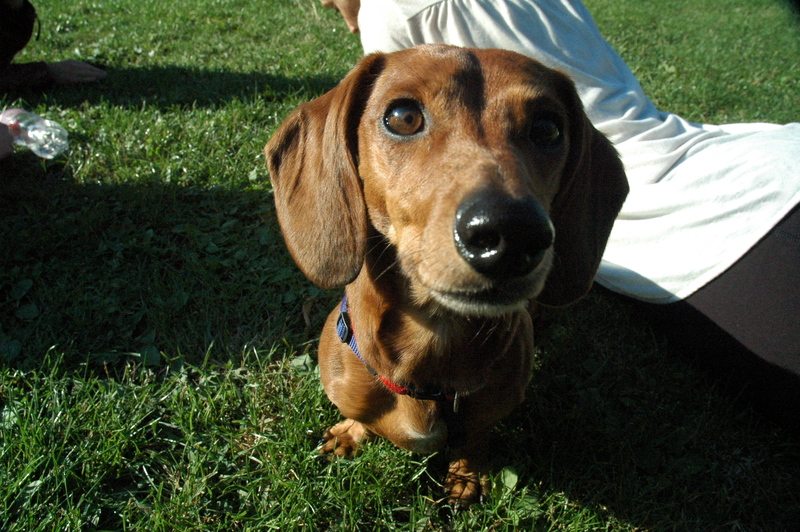 Cindy’s dog, Bobbi McGee, is a miniature dachshund. I am not one for small dogs, but Little Mama (Bob) is cool. She’s pretty skilled at soccer even though she loses every single match (high school varsity + three time All-Campus Intramural soccer champion – I mean, HOW can a dog compete?). The first weekend I watched her with two friends, Kate and Shannen. Kate is the self-processed “fun mom.” The second time I watched Bobbi it was only the two of us – me and Bob. Just two girls trying to make it in the big city. Shannen and Kate. Oh, and some photobombin’ cranes. Bobbi gazing up at her favorite Asian mother. She loves me. Good thing I have such mature friends. Lastly, for those who know me, you know that I am more than a little obsessed with theme parties. 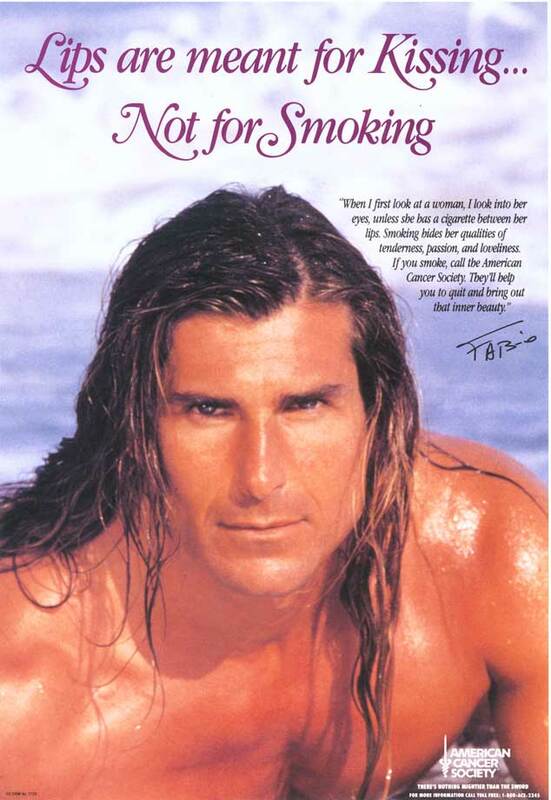 For my 21st birthday, I had a Fabio Lanzoni laden rave. 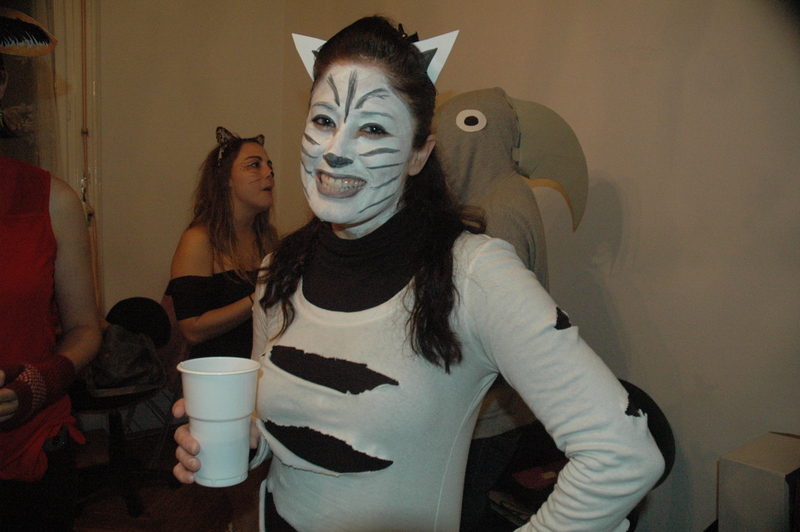 This time I hosted/organized an animal theme party. My friends and I all dressed up like animals. The idea came while a group of girls and I hung out after the wine festival – wine was not involved… The animals that showed up are as follows: tiger, leopard, house cat, manatee, fox, shark, sheep, dog, elephant, zebra, cheetah/zebra (zeetah? ), lion, bumblebee, and penguin. We had an excellent time. 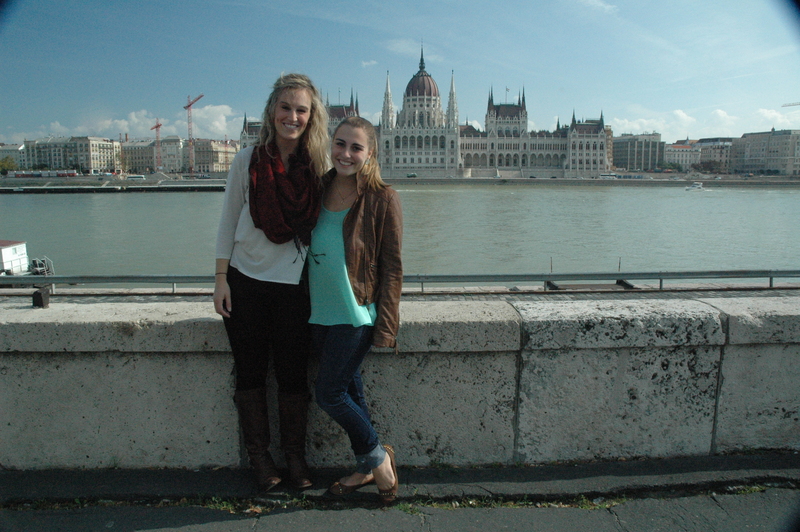 Walking in the streets of Budapest as animals was deliciously absurd – needless to say, my friends and I were huge hits. 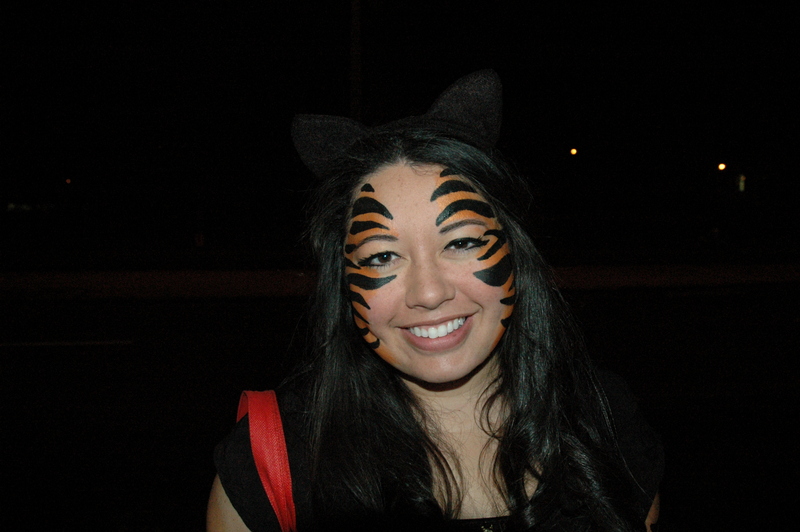 Tigris vagyok (I am a tiger). 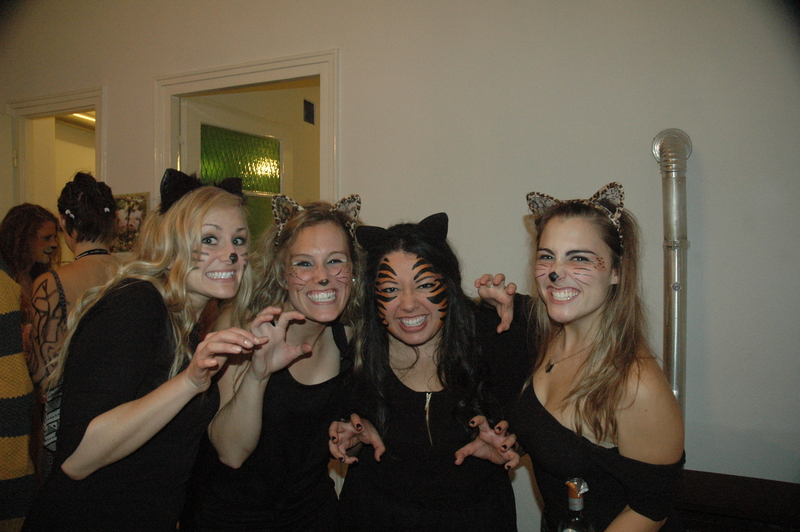 The cats: Alicia – house cat, Kate – leopard, Me – tiger, Shannen – leopard. 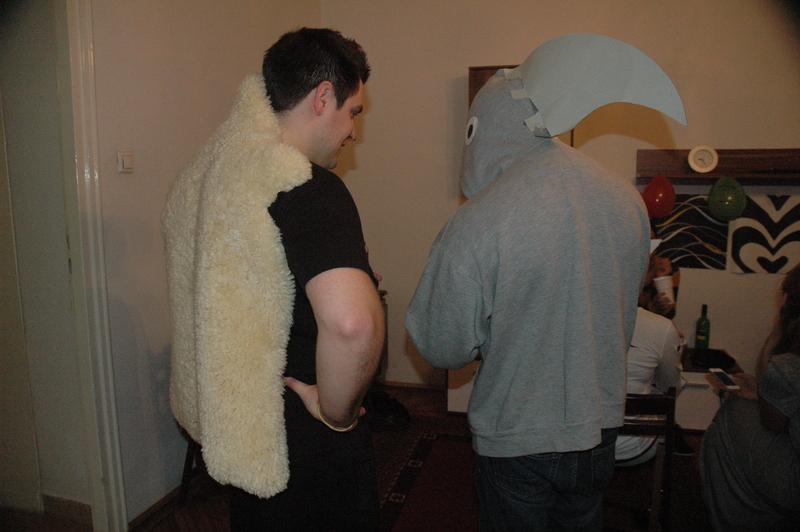 J.P. – sheep and Daniel – shark. PS. Here is a shout-out to my friends and family for sending me cool things and love on my birthday! Love you guys! A Lesson From Miss Jennifer: Constantly reminding your students about your birthday will result in a pan of brownies and One Direction stickers. Thanks boo thing! You and Kate keep appearing in my blog. I should stop hanging out with you guys. xoxo times a billion. I hope you feel better! Looks like a party I would of had a blast at! Miss you!! I hope I feel better as well! And yes, you already know. What is love? = forever.